Is there a forum-like exchange for trading Bitcoins person-to-person? I was to trade Bitcoins for PayPal quite frequently and I know that PayPal doesn't allow Bitcoin exchanges to accept PayPal payments. But there should exist a person-to-person trading site that works like a forum and where people choose how to pay each other, no? 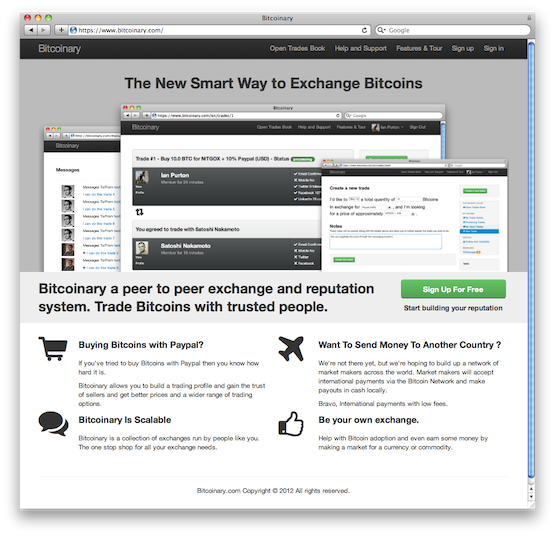 I know about bitcoin-otc, but I'd prefer a forum-like concept better instead of IRC. I think what you are looking for has just been released. LocalBitcoins.com has also trusted buyers list where you can set your trading parties trusted and make trading offers available only for them (to avoid scammers). You can trade Bitcoins for PayPal on #bitcoin-otc on FreeNode IRC, just make sure you deal with people with a good reputation, and that you use the rating system correctly. But beware, the scammers are many on the forums, only the web of trust system on bitcoin-otc will help you avoid scammers. There are a number of places to cash out bitcoins and get the payout through PayPal. You might want to try Silk Road, there you can buy/sell Bitcoin, among other things. Not sure about the rates, though. I use bitcoin2pocket.com quite a lot, fast bank transfers if you are located in the UK. I think they also have set up Paypal payments for people who live outside the UK. CoinTouch (my site) puts you in touch with find friends of friends that want to trade bitcoins. CoinTouch shows offers to buy and sell within your extended social network. Prices are pegged to market rates (MtGox or CoinDesk), at your chosen spread, and thus automatically update every minute. There are no fees, no delays and no BS. CoinTouch can price in all major world currencies. More altcoins coming soon. Currently supports Facebook login - Google and LinkedIn coming soon. Bitalo.com is a person-to-person exchange much like LocalBitcoins and bitcoin.de. SEPA transfers are recommended for making the fiat payment. Bitcoins are kept in multi-signature wallets, and time-lock escrow is used during the trade. The multi-signature solution is similar to the GreenAddress.it and BitGo wallets – the service doesn't hold the user's private key and isn't capable of taking the user's funds. Not the answer you're looking for? Browse other questions tagged exchanges trading paypal otc or ask your own question. Are there any open-source trading bots out there? Is it possible to exchange bitcoins into PayPal credit? Is Bitcoin Hong Kong Exchange a legitimate trading platform? How does exchanges like bitrex exchange coins so fast ? How does crypto exchange got supply of bitcoins?